Well, while I was away doing other things some information about the real life Sgt. Barnes surfaced on the internet. Didn’t expect this as I didn’t expect Stone was using the real name in this case. Platoon depicts two soldiers from 2nd Platoon, Company E, 52nd Infantry (LRP), specifically, S/Sgt. John Barnes portrayed by Tom Berenger and Sgt. Juan Angel Elias portrayed by Willem Dafoe. Stone melds his experience as an infantryman and the characters of Barnes and Elias through the eyes of a green young soldier, Charlie Sheen. The film shows troops of Bravo Company, 3rd Battalion, 22nd Infantry Regiment in 1967/1968. Sgt. Barnes honorably retired from the US Army as a Sergeant Major. Sgt. Elias was killed in action in Quang Tri Province on May 29, 1968, when a grenade he and his team were rigging as a booby trap on an enemy trail accidentally exploded causing the loss of his life and that of Cpl. Donald Robert Miller, and fellow team member, Sgt. Larry Curtis, to lose an eye. I remember one mission in particular. We were working the eastern side of the Da Dan Mountains, approximately 10 kilometers northwest of Bong Son, in the vicinity of Cu Nghi, when we spotted an NVA rice-carrying detail about 200 meters east of our position parallel to our northward movement. They had just emerged from the village and were moving northward balancing bags of rice across their shoulders. We called in the sighting and were directed by brigade to get a prisoner. Suddenly, the enemy soldiers spotted us, dropped what they were carrying, broke formation and bee-lined it back to the village. Well, our team leader, Sgt. John Barnes (Barney), Clarksville, TN, just as suddenly ripped off his rucksack, dropped it in the elephant grass, reached into the pocket of his fatigues and pulled out a big fat cigar, and lit it. Then with a .45 caliber Smith & Wesson in one hand and a CAR-15 automatic rifle in the other, he bolted down the hill towards the village right after them. Spanky Seymour, the team’s RTO, and Sgt. Burt Penkunis, assistant team leader, Elk City, Idaho, decided that they better go after him if we ever hoped to see him again, so off they went down the hill towards the village. Jim Dempsey, Laredo, TX, and I stayed behind taking cover in a cluster of trees on the hillside. Several hours later, who do we see coming up the hill but Sgt. Barnes with two enemy prisoners in tow. The prisoners were wearing khaki pants rolled up above the knees, black pajama tops, and scandals. Spanky and Sgt. Penkunis were right behind them. By then it was dark and the nightly monsoon rain had started. The summer monsoon was petering out by this time but it still had some punch left to it. We knew that because of the rain we would likely have to hang on to the prisoners until daybreak before a 1st Cav helicopter would be able to come out and get them. By midnight, however, we started hearing movement around our position, but because of the rain, which was now heavy, it was difficult to determine if in fact it was enemy movement that we were hearing or if our minds were simply playing head games with us. By about 3:00am or so, we were getting anxious about the prisoner situation. We knew that we would have to move from our position to a more defendable one before dawn as a precautionary measure, but taking the prisoners with us could be a fatal mistake – both for us and for them. If there were enemy soldiers nearby, the prisoners might try to hinder our movement or make noise to give away our position, and we knew that we couldn’t just leave them there to fight another day. By about 5:00 am, the rain started to let up and Sgt. Barnes was able to convince brigade to come get the prisoners. Shortly afterwards, a helicopter arrived on site, picked up the two of them, and off it went to LZ English or An Khe, or wherever they took prisoners for interrogation. I can assure you that we wasted no time in getting off that hillside and into a tree line at the base of the hill that offered some protection from approaching enemy soldiers. I never really heard the story of what happened in that village anyway. 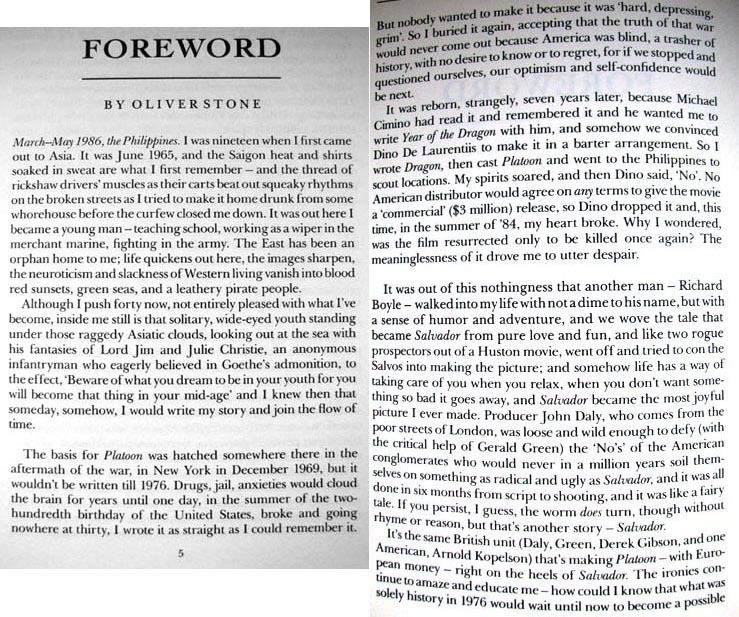 Oliver Stones’ movie Platoon (1986) was based on two soldiers from 2nd Platoon, Company E, 52nd Infantry (LRP). Specifically, S/Sgt, John Barnes portrayed by Tom Berenger and Sgt. Juan Angel Elias portrayed by Willem Dafoe. Oliver Stone served as a rifleman in both the 25th Infantry Division and the 1st Cavalry Division. 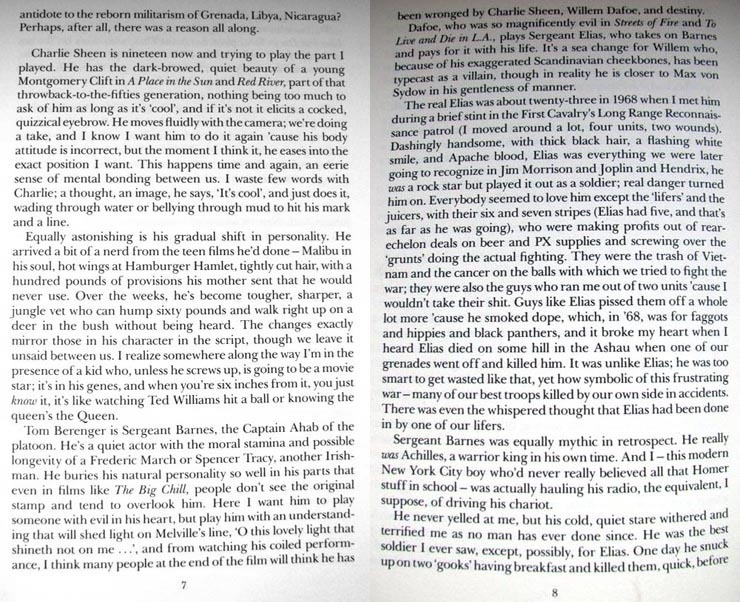 In April 1968 Oliver Stone volunteered for the 1st Cavalry Division’s Long Range Reconnaissance Patrol training, but was dropped from the course because “he was too aggressive and was not a team player.” Nevertheless, Stone melds his line experience as an infantryman and the characters of Barnes and Elias through the eyes of a green young soldier, Charlie Sheen. The film depicts troops of Bravo Company, 3rd Battalion, 22nd Infantry Regiment in 1967, who are often drug-induced and undisciplined, and divided between Sgt. Elias’ integrity and the battle hardened, but heartless Sgt. 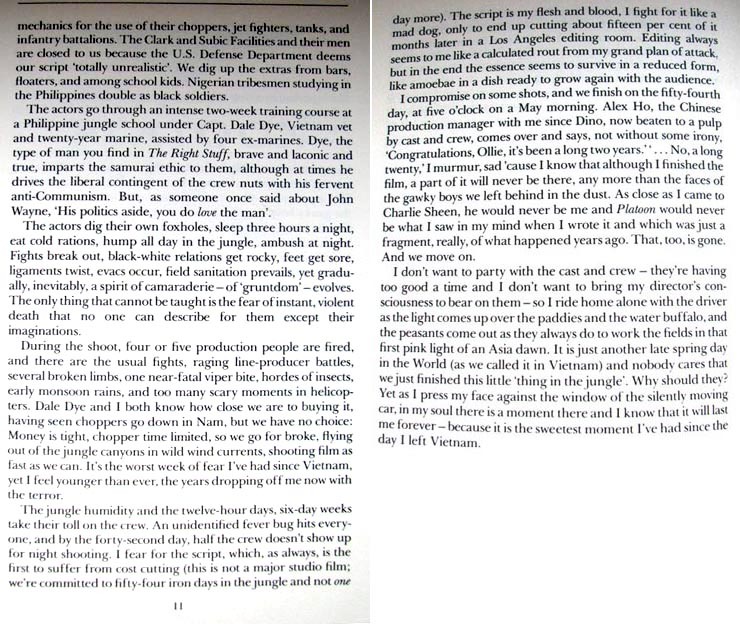 Barnes—a dark portrayal of American servicemen and exaggeration of facts (the drug epidemic did not reach the battlefield till near the end of the Vietnam War). Sgt. Barnes honorably retired from the U.S. Army as a Sergeant Major and Sgt. Elias was killed in action in Quang Tri Province on May 29, 1968, when a grenade he and his team were rigging as a booby trap on an enemy trail accidentally exploded causing the loss of his life and that of Pfc. Donald Robert Miller, and fellow team member, Sgt. Larry Curtis, to lose an eye. Found two other photographs of Juan Angel Elias on the web. HERE and HERE. HERE is his name etched on The Wall. It’s a pity I didn’t know it all while visiting the Memorial in 2000. And HERE you can find him on the Virtual Wall Veterans Memorial. Well, something really new. The film brings some facts together, Stone’s career in Vietnam, and also the background information like the battle of Firebase Burt. For me the most “important” statement of the movie is that Stone never revealed the identity of the Barnes prototype. But there is more about Juan Elias, interviews and a never before seen photo of Young Stone from his time in the Air Cavalry. 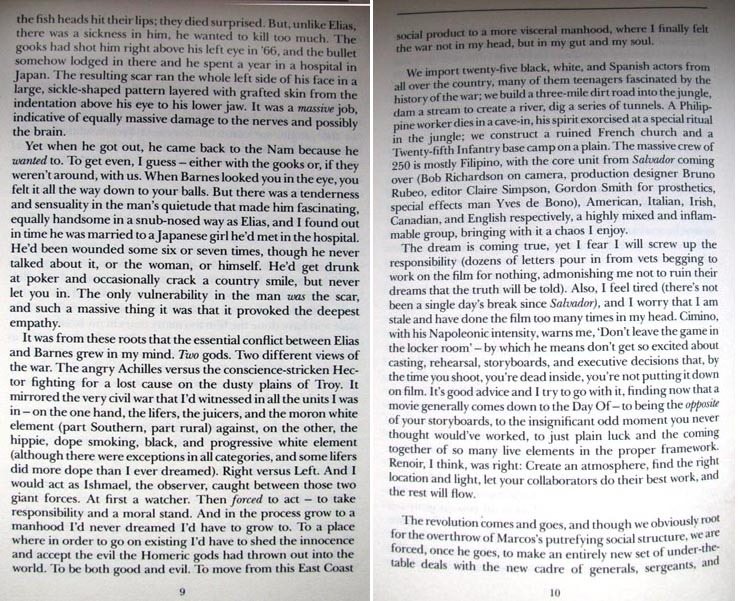 The book looks slightly used and someone obviously worked with the Platoon script, comparing it to the movie, as the scenes are numbered and changes marked. There are also one or two small notes scribbled on the pages, but I haven’t deciphered them yet. I think I somehow hoped to find the initial version of the script, but it’s still the same version as the one that can be found online. Some new information can be found in the foreword written by Stone. Still there was nothing about Break, or THE Platoon, or the development of the script as I hoped. 😦 Nor any details about the first run of scouting and casting… But there is more about the real sergeants than I expected. Some of the lines were quoted in different reviews, now I can read them inside the right context, and from OS himself, so indeed I saw what Barnes was meant to be — a wounded human being, not a “cardboard satan” as many saw him. Tom Berenger is Sergeant Barnes, the Captain Ahab of the platoon. (…) Here I want him to play someone with evil in his heart, but play him with an understanding that will shed light on Melville’s line, ‘O this lovely light that shineth not on me…’ (read the whole piece) and from watching his coiled performance, I think many people at the end of the film will think he has been wronged by Charlie Sheen, Willem Dafoe, and destiny. The gooks had shot him right above his left eye in ’66, and the bullet somehow lodged in there and he spent a year in a hospital in Japan. The resulting scar ran the whole left side of his face in a large, sickle-shaped pattern, layered with grafted skin from the indentation above his eye to his lower jaw. It was a massive job, indicative of equally massive damage to the nerves and possibly the brain. Does it mean they ruined Barnes’ face in the hospital trying to extract the bullet? Jesus…. I like the way the tidbits appear “out of nowhere” once we’ve had discussed them. Like the possible Barnes’ brain damage, that stayed below my radar for 20 years, until recently. When Barnes looked you in the eye, you felt it all the way down to your balls. But there was a tenderness and sensuality in the man’s quietude that made him fascinating, equally handsome in a snub-nosed way as Elias, and I found out in time he was married to a Japanese girl he’d met in the hospital. He’d been wounded some six or seven times, though he never talked about it, or the woman, or himself. He’d get drunk at poker and occasionally crack a country smile, but never let you in. The only vulnerability in the man was the scar, and such a massive thing it was that it provoked the deepest empathy. I heard Elias died on some hill in the Ashau when one of our grenades went off and killed him. It was unlike Elias; he was too smart to get wasted like that, yet how symbolic of this frustrating war – many of our best troops killed by our own side in accidents. There was even the whispered thought that Elias had been done in by one of our lifers. Stone uses the names Barnes and Elias, not the Barnes/Elias character as he often does in the commentary — does this indicate Barnes was the man’s real name? There is also a nice piece about Charlie Sheen, unluckily Stone’s prediction about him becoming a big star didn’t really came true. An interesting behind-the-scenes tidbit: they actually built the church ruins, which later were used for For the Boys in 1990 or 1991, so it was a solid construction. And I wonder if Stone, more or less consciously copies the church from Apocalypse Now from the scene where Willard meets Kilgore for the first time. …just plain luck and the coming together of so many live elements in the proper framework. Editing always seems to me like a calculated rout from my grand plan of attack, but in the end the essence seems to survive in a reduced form, like amoebae in a dish ready to grow again with the audience. And those lines that are filled with a certain sadness about the impossibility of putting the vision on screen completely. I know that although I finished the film, a part of it will never be there, any more than the faces of the gawky boys we left behind in the dust. As close as I came to Charlie Sheen, he would never be me and Platoon would never be what I saw in my mind when I wrote it and which was just a fragment, really, of what happened years ago. I wonder how Platoon would look like if Stone had more time and money, how his vision actually looked like. Reading the script now one automatically see the movie and the actors… Although since reading Break, I started to see Elias in a different light, as if the image of a rebellious Indian kid blended into the final form of Dafoe’s performance. Went through all AirCav websites I could find, looked at all photos I could find. I don’t know what what exactly I was looking for. Some hint, maybe a photo of Oliver Stone or at least his name on a roster or in a memoir… Of course, it’s like looking for a needle in a haystack. So far I’ve only found out that one of the units had a monkey — Mr. Monk. Made me think of script-Elias and his monkey. Unfortunately Elias’ name couldn’t be found on any available list. Nor Stone’s. The monkey could be something Stone just heard of, or imagined, or there was a pet-monkey in every second unit in Vietnam. Finally I took a plunge and re-read the book. To my surprise it was a much better read than my first attempt in 1997. Which is good indicator for my increasing English skills. *proudly tapping myself on the shoulder* I still get lost in the military and radio lingo though, so it is nothing I will read again just for fun. There is a striking dissonance between the moods in the book and in Platoon. It felt as if Bravo Company belonged to a completely different universe, to another, cleaner, more logical war than that described by Stone. Hemphill’s war is like a strategy game: there were some bloody moments, but recalling it I have an impression of observing everything from a bird’s eye view. Probably it’s because Hemphill did have a different perspective. He knew the tactics, the “bigger picture” of what’s going on, but it was not a grunt’s POV. There are two particular moments echoing the movie. The first is the attack at the Firebase Burt near the Cambodian border, on the New Years Day 1968 when the 9th VC Main Force Division overran the perimeter and the air support had to drop napalm dangerously close to American positions. There was some hand to hand fighting that night, and in the morning bulldozers were digging mass graves for the dead Vietcong — the enemy body count was about 500, against surprisingly low american casualties (unlike in the movie, where it was like a final extermination of the platoon’s leftovers). Another incident reminds of the church battle: the point man was killed as the unit entered a bunker complex masked by ant hills (remember Chris hiding behind an anthill?) There is a piece of dialog surprisingly similar to the radio talk between capt Harris and a panicked soldier, and a glimpse of bodies uncovered by wind blow. And I think that capt Harris is based on Hemphill himself. The book was clearly written as an answer and a counterbalance to Platoon. But if people see it as “denouncing Oliver Stone’s lies” it’s because of a misunderstanding. IMO the problem is caused by Stone showing the unit’s name so prominently at the beginning of the film. Is suggests that all what happened took place in that one unit. Stone explained, over and over again, that the movie’s story is a compilation of his experience in four different units, but that statement is easy to overlook. Stone was in Vietnam from September 67 to November 68. Hemphill — from October 67 to February 68, which means he left before things started to worsen. And to state accidents like drug use, fragging etc., didn’t happen at all only because they didn’t happen in Hemphill’s company during Hemphill’s tour, make as much sense as stating that Platoon is the only true movie about the Vietnam war. To me both, the movie and the book, are parts of a bigger picture.